¯ POLAND — Alexander Jacques, 32, was charged with failure to yield the right of way. 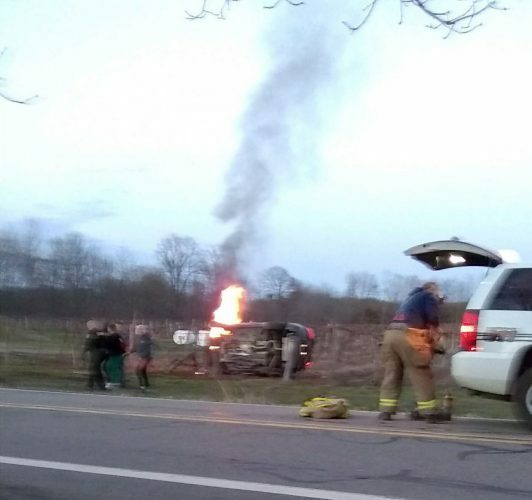 Deputies responded at 3:15 p.m. on Friday to a crash on Route 392 in Poland. It was found that Jacques failed to yield to another driver, striking the vehicle head-on. Both drivers were taken to UPMC Chautauqua for non-life-threatening injuries. Jacques was issued traffic citations to appear in Poland Town Court at a later date. ¯ ELLERY — Kay A. Johnson, 60, of Bemus Point was charged with driving while intoxicated, driving with a blood-alcohol content of .08 percent or greater, failure to keep right and moving from lane unsafely. Deputies stopped a vehicle Saturday at 2:48 a.m. on Main Street in Ellery for multiple traffic violations. Johnson was later found to be intoxicated and was taken into custody. She was released with appearance tickets to be in Ellery Town Court at a later date to answer the charges. ¯ SHERMAN — Randy A. Thoms, 28, of Sherman was charged with seventh-degree criminal possession of a controlled substance and unlawful possession of marijuana. Deputies were investigating an incident Friday in Sherman when Thoms was reportedly found in possession of a controlled substance and marijuana. He was issued an appearance ticket to be in Sherman Town Court at a later date. ¯ SHERMAN — Trever J. Kneer, 19, of Sherman was charged with second-degree burglary, third-degree robbery, petit larceny, unlawful imprisonment and endangering the welfare of a child. Deputies were called Friday to a location in Sherman for a reported burglary. An investigation found that Kneer entered a residence unlawfully and forcibly stole property. During the incident, deputies said Kneer barricaded a victim in a room against their will and did not allow them to leave. Kneer was taken into custody, arraigned in Sherman Town Court and remanded to Chautauqua County Jail. He was held without bail. ¯ Craig R. Zinger, 55, of Frewsburg was charged with felony driving while intoxicated, felony first-degree aggravated unlicensed operation, DWI per se, leaving the scene of a property damage accident, consuming alcohol in a vehicle and second-degree obstructing governmental administration. Carroll police were called to an accident at 11:12 a.m. on Saturday on Frew Run Road. It was reported that a truck ran off the road and into a ditch. Officers found a smashed address sign and a black pickup truck a short distance away with fresh front-end damage. Zinger was located nearby and determined he was driving the truck. He was taken into custody and remanded to Chautauqua County Jail. He is scheduled to appear in Carroll Town Court at a later date to answer the charges. ¯ Cassandra M. Pacheco was charged with driving while intoxicated, DWI per se and failure to keep right. Lakewood-Busti police responded at 12:36 a.m. on Sunday to Forest Avenue Extension in Busti for a report of a car into a ditch. Upon arrival, officers found a sedan in the ditch with the driver, Pacheco, uninjured. An investigation found that Pacheco was allegedly operating the vehicle in an intoxicated condition. She was processed and issued appearance tickets to be in Busti Town Court at a later date to answer the charges.